On a misty, grey Saturday morning, Tim and I crossed the Strait of Georgia for an early Christmas dinner with my parents and siblings. As the crow flies, it's a distance of 133 km, or 82 miles. As the weather goes, it's like moving from one climate to another. Mist and rain soon gave way to fat snowflakes splatting against the windshield. We arrived at noon and the snow continued through the afternoon, into the evening and through the night. In the mosaic above two photos show the amount of snow on our SUV, one taken in the afternoon, the other this morning. 10-12 inches of beautiful, white, fluffy snow. After clearing off the snow, we set out for home. All of these photos were taken as we drove, through the windshield, or out the side window. I'm utterly enthralled by the beauty of snow. 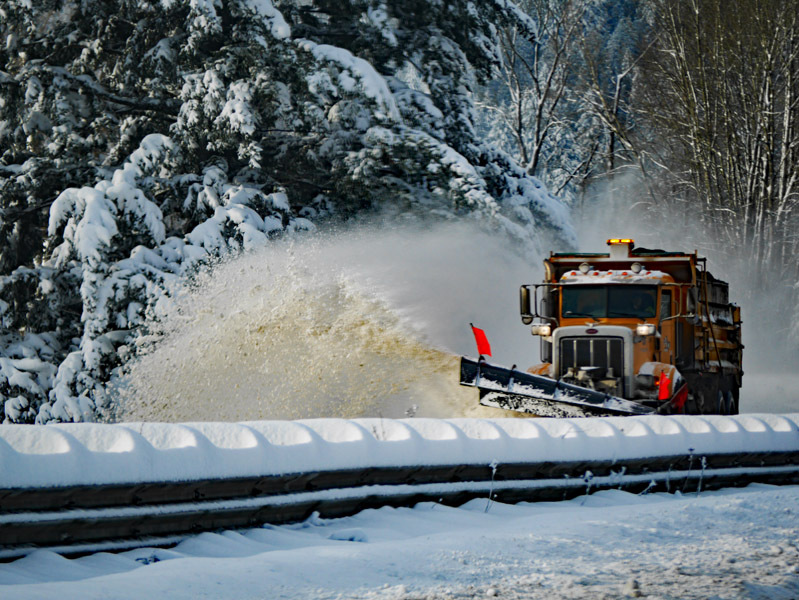 Snowplows and sanding trucks worked through the night to clear the highway. Wreaths of cloud clung round the blue and white mountains with beauty that made me ache with the longing for words to describe it. In the opposite lane I managed to capture the snow plow barreling along, throwing up great waves of snow mixed with sand from the road. A feast of delight for the eyes and the soul. And then, one last gift before we left the snow for brown and green fields and the grey ocean. A pair of snow geese, necks stretched long in flight, beating their wings as they flew overhead. 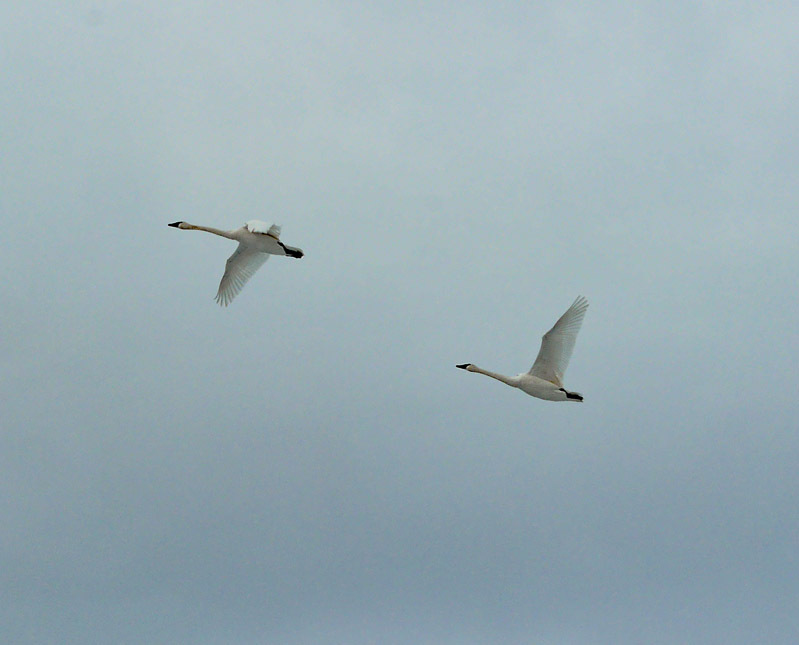 Edited to add: Thanks to Sara, I checked and these are indeed Trumpeter Swans and not Snow Geese. They are so lovely, aren't they? The snow looks so beautiful...you have managed to capture its brilliance. Stunningly beautiful, a fabulous backdrop to your family weekend. Happy MM. Wow! Really so pretty. Amazing how different the weather can be just a little over an hour away. Wishing you a lovely Holiday Season! Happy Monday to you Darling Lorrie ! I love that first falling of snow when the world looks so pristine - a beautiful white winter wonderland - you have captured that feeling perfectly - no signs of any snow here. You are appropriately grateful for the beauty of the snow. I need work as I am tending to grumble. I will be out clearing the drive at least three times to keep ahead of the anticipated 6 to 10 today. Perhaps when I am driving up to see my father, I will appreciate the beauty. Hope so! It certainly has that festive, Christmas look. Such stunning views, thank you for sharing them. Now that is truly a winter wonderland. So pretty! Beautiful, but not so easy to get about. My daughter tells me that Vancouver is under snow....and she has to get to the airport next week! You got the snow you were hankering for, and we got some gorgeous images! You certainly took us on a beautiful journey. Stunning scenes of beauty. your photographs are just beautiful. How I miss BC and the wilderness and beauty of it. Such wonderful photographs, and I especially like the snow plow barreling along too - great shot. So stunningly beautiful and I am more than a little envious! Your photos are gorgeous. Enjoy your winter wonderland! Snow makes things look so pretty! I like snow...as long as I can admire it from the cozy indoors. Great shots! 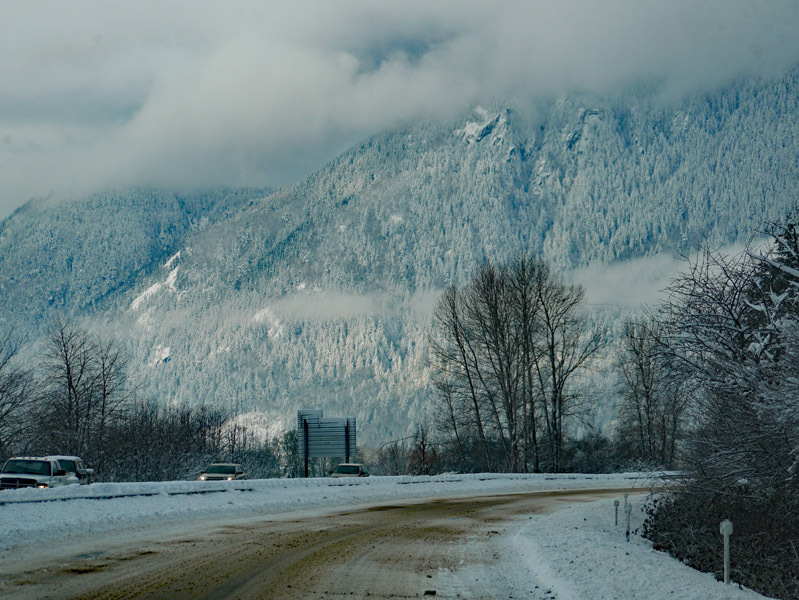 So you braved Chilliwack in the snow storm when churches even cancelled their services. Glad you had safe travels. The snow geese are magical! Yes, it is a winter wonderland, which you have shown so clearly with your photos. Thank you, Lorrie! Wow! Amazing how beautiful the whites and blues are... a wonderland indeed. And your artist's eye captured the scenes beautifully. A feast for the eyes, although looking at these photos makes me cold to my bones. Thankfully, we have heated vehicles and homes! What delightful pictures. I, too, am a fan of snow... if I don't have to get out in it, that is. We haven't had one this season but I am sure we will at some point. 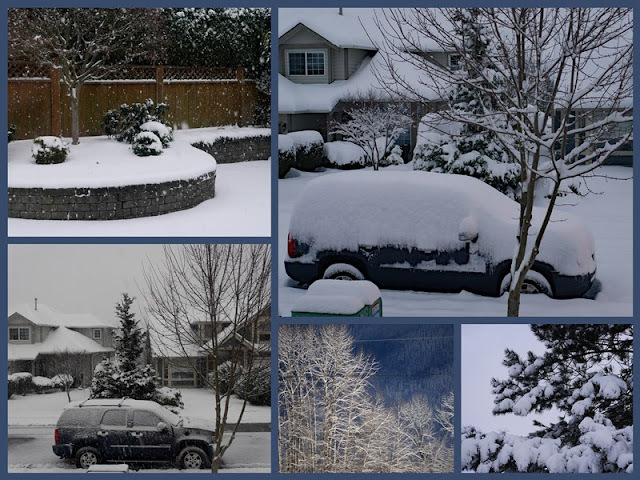 Such breath taking snowy pictures...thank you so much for sharing these Lorrie. You really captured the blue and white snowy magic and even included the snow geese...so beautiful. Breathtaking photos, Lorrie...and throughly enjoyed from inside my nice warm house!! We've got snow falling right now but it won't be anywhere near as pretty as that on the mountains! Awesome! Lovely pic's...captured in my corner of the world! It is a picture perfect winter wonderland out there still...but the wind is howling over here today and I haven't set foot outdoors to take any pictures. 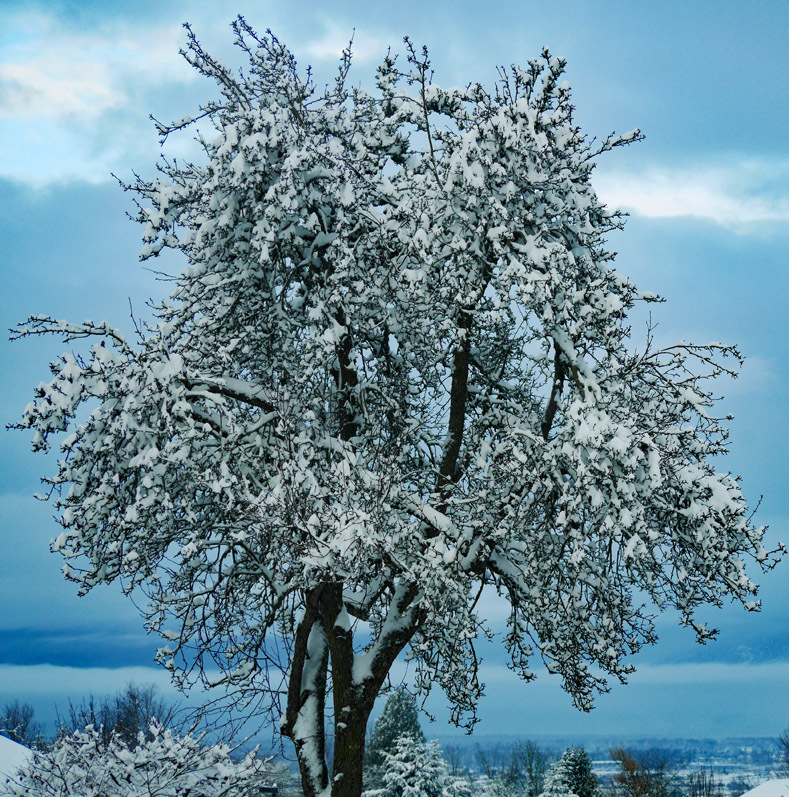 Thank you for sharing the beauty of the gorgeous snowfall, Lorrie, as seen through your eyes! In your previous post, I'm now wanting a mug of hot chocolate with homemade marshmallows and some spiced pecans. I have made marshmallows and there's nothing quite like them. There is magic in the song "Walkin' in A Winter Wonderland." 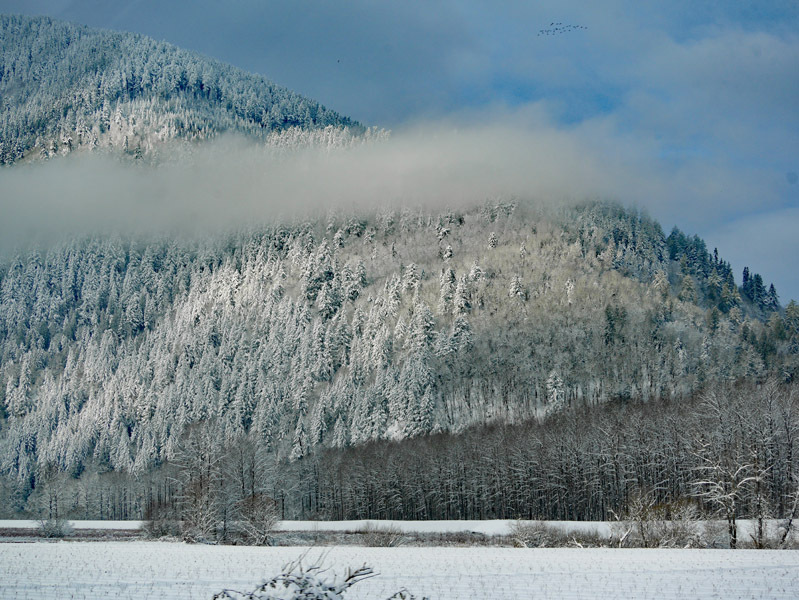 A snowscape is certainly beautiful and you live in beautiful country. I love the swans in flight, something that we would never see here. Beautiful photos. 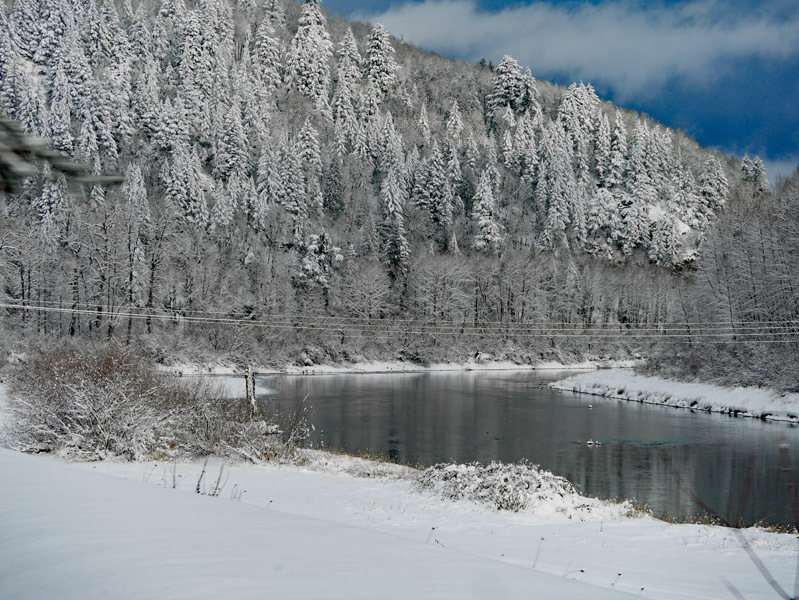 You're lucky that with a short drive you can enjoy the wintry snow scenes that we have for several months. Time with family is always nice but these snowy photos! Wow! Wonderful photos of mountains and snow, Lorrie, and the snow plough photo is (surprisingly) beautiful as well! Oh my! What beauty in the snow, but those snow geese are the icing on the cake. Just gorgeous! Beautiful snowy scenes, Lorrie. I was amazed at the amount of snow they got in the lower mainland after talking with my sister. Glad you had a safe trip.